This is my first Christmas hanger this year. It is made from the new freebie from the prairie schooler. It is such a nice pattern. 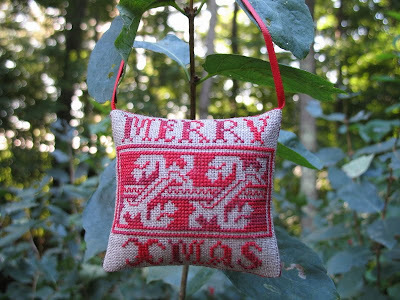 I finally completed one more Christmas Ornie.. It's for May.. Hopefully I will catch up with the rest soon ! lol I have attached this beautiful design (by Joanne Sanderson) to a gold metallic card, but when I scanned it, the card looks black. I suppose because of the reflection.. The size of this design is 2 1/2 " x 2 1/2 " on 18 ct. white aida. 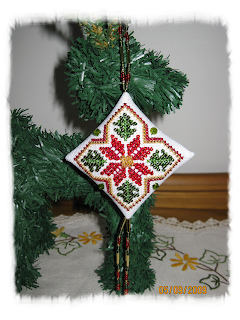 This is a Mill Hill Christmas Ornament Kit called 'Poinsettia'. 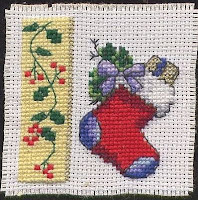 Stitched on 28 count Linen with DMC threads & Mill Hill beads. 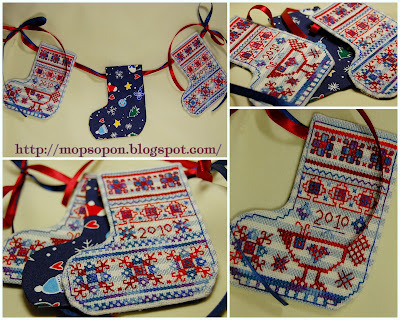 I have 2 more of these lovely little kits in my stash that I hope to get finished before Christmas (this year).